Once you have created a patient you will need to activate the patient before they receive their login credentials via an automated email. To activate a patient simply select the ‘Active’ box in the upper right of the Patient Detail & Exercise Assignment window (this is the main window that is displayed anytime you open a patient). 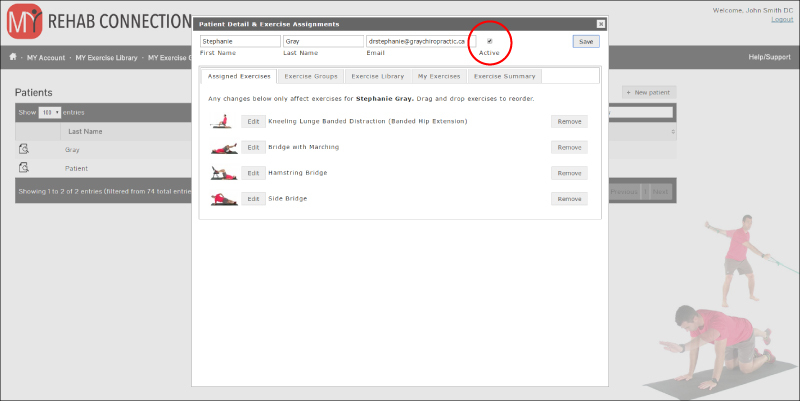 Note: Anytime you make any changes to a patient’s exercise program (add or remove an exercise, change the order of the exercises) the patient’s app will be automatically updated when you hit “Save”.